Showing results for tags 'birthbysleep'. I was actually going to upload this on the day of the 15th anniversary of good ol KH, but I kinda forgot to. Hope ya Enjoy! 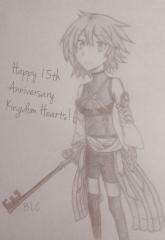 And happy 15th Kingdom Hearts! Please do not repost this in any form without my permission to do so first. Also, if I do give you my permission, please remember to credit my work as done by me. Thank you very much! "Destiny is never left to chance."